"Rotas, Rules and Rectors – How to thrive being a Churchwarden" | by Matthew Clements – now available just published! "Rotas, Rules and Rectors – How to thrive being a Churchwarden"
by Matthew Clements – now available just published! Welcome to the website for THE definitive book on being a churchwarden. 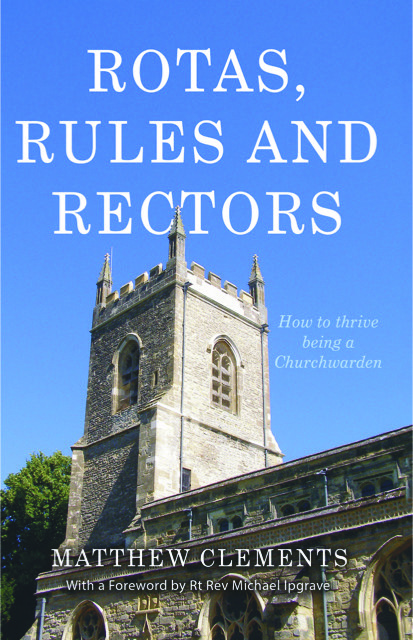 “ROTAS, RULES AND RECTORS – How to thrive being a Churchwarden” is aimed at illustrating the scope of the churchwardens’ job with a variety of examples from my own experience of being both churchwarden and treasurer in different Anglican churches. In my view there is a distinct lack of practical advice about what the job actually entails, and I suspect that this deters many people from doing the job at all. There are other books available but these tend to concentrate on the legalities such as elections and how to run meetings, or how to re-order your church. The focus of the book is on thriving in the job as opposed to merely surviving! The job is not impossible, but with a bit of planning and determination much can be achieved; my hopes are that this book will encourage more people to look at the churchwarden job as something that they could do, and also help elected churchwardens to be more productive in their term of office. This can only be of benefit to the church as a whole, as well as to their own sense of achievement. This book started when I started to write a short handover piece for my new fellow churchwarden for her education about what she had taken on, and it just grew from there. It is aimed at the 30,000+ elected churchwardens in the UK, of whom several thousand are newly elected each year. It is also appropriate for those who might be considered for nomination – hopefully it will sway them in the right direction – and for the vicars who want to get the best out of their church officers. I could have done with this when I became a warden in 1994 at the age of 25. My wife and I enjoyed reading your book over the Christmas period and I found myself nodding in agreement time and again. It's very readable and full of wisdom. Despite the title I have given, I don't actually know this for myself yet!! The book was bought for the memsahib who is coming up to the end of her 2nd year as churchwarden (the last year being the sole CW). The following is what she has told me: "Have found the book very useful & enlightening. If read prior to becoming churchwarden, might have thought twice!! Having read approx. one-third so far am looking forward to reading the rest which I feel sure will stand me in good stead for whatever might crop up in the future". I myself, being merely treasurer, organist & in charge of magazine am also very much looking forward to reading at some point in the future. Many thanks for such an excellent resource. I'm possibly going to be elected churchwarden this year so thought this would be a useful book to read and it certainly was! Although it's packed with lots of information, the writing style makes it easy to read, and it's set out in a clear, logical way. I'd recommend it to anyone interested in the role. Book has come. A lovely book to handle, and reads in an easy way, and the content is cheerfully fascinating. We knew very little about these activities before, and although we are not individually involved in this particular field, we are sure that after reading this we can’t help but be wiser about how people can work better together for the good of others. We hope that it will be widely studied. This is very readable and a thorough insight into the work of a churchwarden. The various aspects of the job are discussed in a logical and organised fashion, and Matthew's anecdotes are written with humour, respect and patience towards all involved. 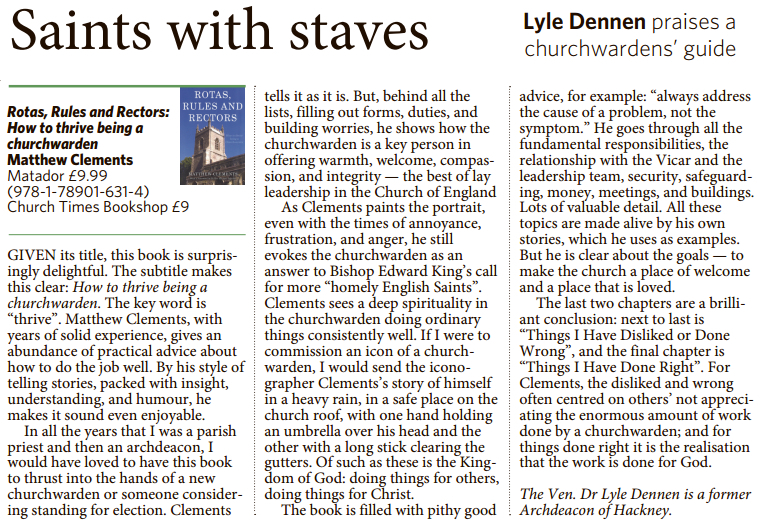 Full of practical advice, the book elucidates the diverse responsibilities of the churchwarden; recognising that the post is a challenge and then simply telling you how these challenges can be met. The book covers such a range of subjects (from the maintenance of historical buildings to building relationships / teamwork issues) that as a non church goer I still found it interesting, and for today's churchwardens it would be indespensible. A very warmhearted, positive book and nicely up to date. Think others might be interested?